Habit: Annual, perennial herb, from large, fleshy, tuber-like root. Stem: glabrous to scabrous; tendril branched or not. Leaf: lanceolate to round, entire to deeply lobed. Inflorescence: flowers 1 per node, staminate, pistillate at different nodes. Flower: corolla > 2 cm wide (staminate generally < pistillate), deeply cup-shaped, yellow to orange, fused part 4--12 cm, lobes generally recurved; stigmas 3, 2-lobed. Fruit: spheric to oblong, indehiscent; rind firm, smooth to rough or grooved. Seed: many, < 20 mm, +- ovate, +- flat; margin thick or raised. Habit: Herbage scabrous; tendril branched +- from base. Leaf: 8--15 cm, palmately lobed, gray-green, main veins +- white, lobes generally 5, free +- 1/2 to petiole, terminal 3 triangular or wide-lanceolate, generally entire. Flower: corolla 6--8 cm, yellow. Fruit: 8--9 cm wide, spheric, dull green, mottled, with obscure, +- white stripes. Seed: 10--14 mm, white. Chromosomes: 2n=40. 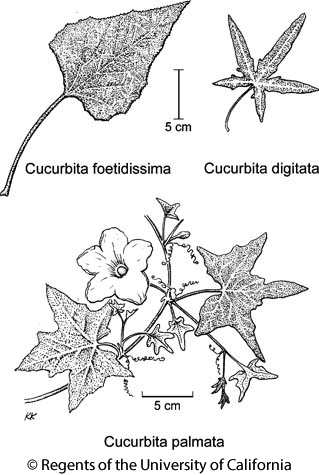 Citation for this treatment: John M. Miller & Robert L. Schlising 2012, Cucurbita palmata, in Jepson Flora Project (eds.) Jepson eFlora, http://ucjeps.berkeley.edu/eflora/eflora_display.php?tid=21365, accessed on April 19, 2019. SnJV, CW, SW, D; Markers link to CCH specimen records. Yellow markers indicate records that may provide evidence for eFlora range revision or may have georeferencing or identification issues. Purple markers indicate specimens collected from a garden, greenhouse, or other non-wild location.